I am trying to find a crib pull toy for my son. It is from the Prestige company sold as Carter’s I think. 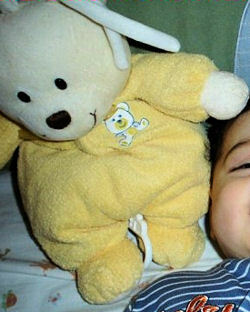 It is a white bear wearing yellow pajamas. It is not the one that is zig zag (accordion??) throughout the body. The number of the toy on the tag has long worn away from washings. It used to be musical, but the inside of it broke. I received “Baba” as we call him as a baby shower gift. He was never meant to be a toy that was carried around. He isn’t that stable. Anyway of course this is the toy that my son feel in love with and loves dearly. He carries him around every where and in the Alaskan winters that wasn’t the best for Baba. Anyway he doesn’t play music anymore and Carlos can’t understand why. Also, I am afraid that he will break at any moment, because his fabric is so thin from washings. This appears to be your bear if you are still searching.